Went to Dat Blast Zone today. Managed to make it out of pools at second seed, but I got beyond bracket gooseberry fool in pro. Had to face J.Miller round 1, then either FROG or DX17 in losers round 1, both considered to be some of the top players in the UK. As a result, I went 0-2 in bracket and overall came 25th which I'm a bit disappointed about because I feel like I would have been able to get further in the bracket. The event was good fun and it was good practice too. VSFighting is next week and I am really hoping to do well then, but only time will tell I guess. Was cool meeting you there. We should definitely do more diddy dittos this week if possible. In other news, I got top 12, missing out on top 8 once again which is a bit irritating, but oh well, maybe next time. So the bracket results, nice going guys. I was wondering if there was any way of finding out when/where the next DAT blastzone is? Or has it not been announced yet? I was also wondering for those who've played me how you'd think I'd do at that kinda competition. I'd love to go just for the experience of a large event itself, I'm just intrigued. I guess getting out of pools would in my eyes be good, winning anything after that a success. Icarus1497 wrote: So the bracket results, nice going guys. I was wondering if there was any way of finding out when/where the next DAT blastzone is? Or has it not been announced yet? Next DBZ is the 27th of August. Obviously I'd be unsure on how you would do as I've never played you, but I can tell you pools are never free. DBZ was a really fun event and I would definitely recommend it to everyone. 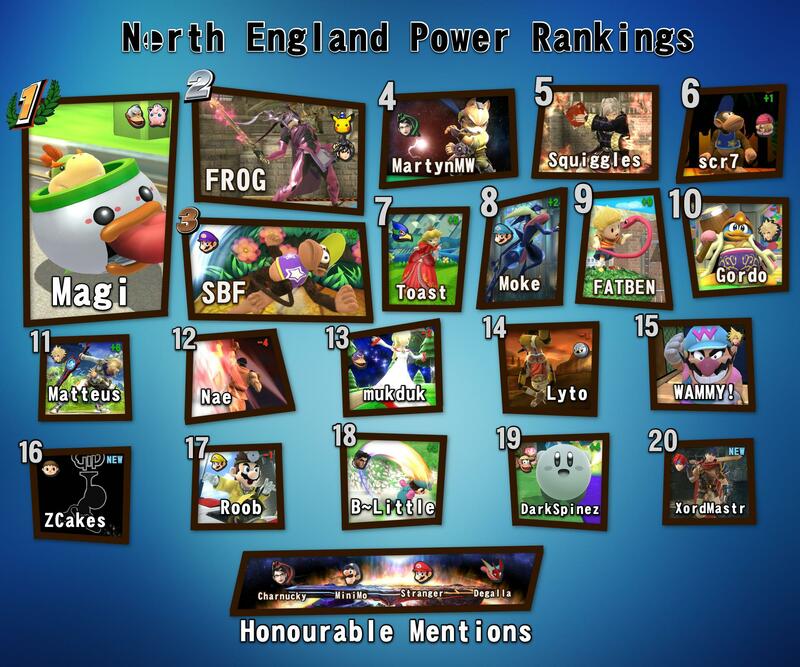 We have also arranged a northern Smash Summit where the top players from the north will go to someone's house and play Smash Bros for the weekend and the whole event will be streamed. It's happening on the 12th-13th of August and it's going to be a really good time. And @Jezo I'll be free all week so whenever you want to play just message me on FB or PM me. Managed to claim 17th at VSFighting. Really happy with my results as I was super close to making top 16 at my first major. Hoe4u knocked me out of winners 2-0 (even though both games were super close) and Aera knocked be out of the tournament, with the score being 2-1. By making top 16 I may have been able to make more of a name for myself, but ah well, next time. Credit to Jezo for making top 16 though! The stream starts at 12PM both Sat and Sun so tune in if you want. This looks cool. Have not been interested in the game competitively since, well, last year, but I like to try out stuff like perfect pivots whenever I play friendlies and will be playing around with this for sure. Even more so, I'm interested in seeing this used in top level competition since I'm still fairly interested in viewing it. Seems like a great tool for closing in spaces. Pretty sure someone found a similar tech like this a while back but it was never paid much attention to. I won the Newcastle tourney, not dropping a set and beating Magi in grands. Sabrofra wrote: I won the Newcastle tourney, not dropping a set and beating Magi in grands. Awesome seeing how far you've come dude. Keep it up Sab! Yeah they were, the playlist is here (part 3 at 2 hours 32 mins is mine vs Magi's match) -PS Tale of the toaster's commentary is cancerous. Dw he gets kicked off after game 2. He's actually planning on picking up a high tier properly now. The only high tier secondary he has is Ness at the moment so he might choose him. H.Kazuhira wrote: Awesome seeing how far you've come dude. Keep it up Sab! I thought he had a Cloud as well, or is that just a specific counter-pick. In other news, Heir was amazing to watch. Wish I had gone. Going to up my tourney-going game from now on. Now I wish I could take part in Smash tournaments. Though, Dedede won't get me too far, I don't think. I might need a pocket character. Also, why were those commentators talking about Robot Wars and the Tweenies. Kriken wrote: I thought he had a Cloud as well, or is that just a specific counter-pick. He only used Cloud that one time at FragSoc 3 because he knew Genki had a Cloud problem, so took advantage of it and went Cloud. Troggy wrote: Also, why were those commentators talking about Robot Wars and the Tweenies. That specific person is such a cancerous commentator, hence why myself and Magi asked for him to be removed from commentary. I played Mario yesterday and he's pretty decent. How's about we do Mario and Diddy dittos/Mario vs Diddy tomorrow sbf? Sure. Just message me on FB when you want to play. salty af that i'm not in the country for ages so i'm missing all the cool tournaments. gonna be russsty when i get home. Managed to claim 2nd at SmashDash yesterday. I was beaten by a Bayonetta in pools 2-0 meaning that I had a bit of a tougher time in Pro bracket, as I came out of my pool 2nd seed. Luckily I manged to get to winners semis before being knocked into losers. FROG knocked me into losers 3-0 (winners semis was Bo5 for some reason), and then beat me in grands 3-0 again. I managed to beat Magi again, 3-1 this time which I'm really happy about. With SmashDash being my last tourney for a while, I'm really happy with how I did. Winners semis being bo5 seems pretty normal. It's typically Bo3 at SmashDash though. Bo5 only happened because Magi's opponent said that winners semis is Bo5 (Magi is a TO so he should've known it was Bo3 lol) and he just went along with it. As a result, the other winners semis match had to be Bo5 as well. Link as image is too big.